Winner of the Junior Boys’ Singles title, amid stiff opposition from the host nation, at the recent 2018 China Junior and Cadet Open in Taicang, Japan’s 16 year old Kakeru Sone was the player to shine at play commenced in the Under 21 Men’s Singles event on Tuesday 17th July, at the Seamaster 2018 ITTF World Tour Platinum Shinhan Korea Open in Daejeon. 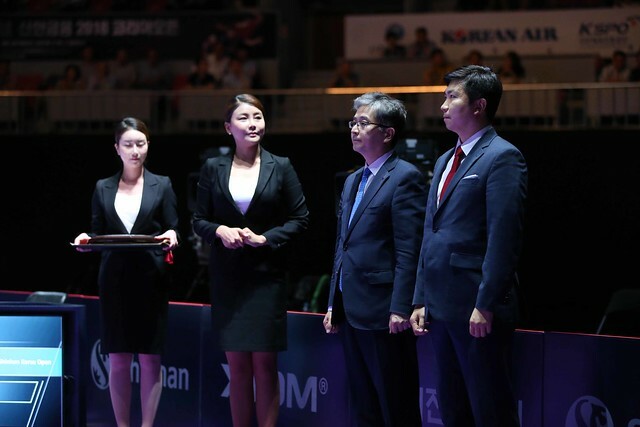 Meanwhile, in the counterpart Under 21 Women’s Singles event, the young lady to catch the eye was the host nation’s Kim Yealin, also 16 years old. Maintaining the form displayed earlier in the month in Taicang, Kakeru Sone recovered from a two games to nil deficit to beat colleague Yuki Matsuyama, the no.4 seed (7-11, 6-11, 11-5, 12-10, 11-7), a player who has enjoyed notable success at ITTF Challenge Series tournaments. In 2017, he won the Under 21 Men’s Singles title in both Croatia and Slovenia. A surprise win, arguably the success gained by Kim Yealin was even greater; her only current world ranking is that of no.486 on the Under 18 Girls’ listings. In a contest even closer than that involving Kakeru Sone and Yuki Matsuyama, she withstood a spirited recovery to beat Japan’s Maki Shiomi, the no.4 seed (12-10, 11-8, 7-11, 6-11, 12-10). Notably, in 2017 on the Seamaster ITTF World Tour, Maki Shiomi had won the Under 21 Women’s Singles title in China whilst being the runner up in Australia. Two surprise outcomes and there was one more as play commenced in Daejeon; India’s Jeet Chandra, the no.16 seed, was beaten by DPR Korea’s Ham Yu Song (11-4, 11-9, 11-7). A win against the odds, no doubt if Ham Yu Song had been subject to more international play in the past, his status would be higher. Otherwise as play commenced on the opening day, matters advanced according to plan. Notably, in the opening round of the Under 21 Men’s Singles event, the top three names all made success starts, a situation that also applied in the Under 21 Women’s Singles competition. In the former Japan’s Yuto Kizukuri beat Korea Republic’s Jeong Chanhee (13-11, 11-5, 11-7), Mizuki Oikawa, also from Japan overcame Uzbekistan’s Kutbidllio Teshaboev (11-1, 11-7, 11-3), Hong Kong’s Ng Pak Nam defeated Ma Jinbao of the United States (12-10, 11-7, 8-11, 12-10). Likewise in the Under 21 Women’s Singles competition, Hong Kong’s Minnie Soo Wai Yam proved to consistent for Korea Republic’s Ku Kyojin (11-4, 11-6, 11-3), Japan’s Miyu Nagasaki prevailed against Uzbekistan’s Regina Kim (11-6, 11-3, 11-9); Miyu Kihara, like Miyu Nagasaki from Japan, ended the hopes of Chinese Taipei’s Chen Yen-Hsin (11-3, 11-9, 11-7). The second round of both the Under 21 Men’s Singles and Under 21 Women’s Singles events will be completed later in the day.